The Food Bank of Northern Nevada is a regional food distribution center and support system for more than 140 non-profit partner agencies across our 90,000 square mile service area. Feeding the hungry today and solving hunger for tomorrow through community partnership. 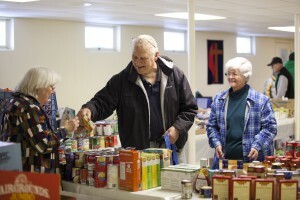 The Food Bank incorporated in 1983 and has operated as a 501C3 non-profit organization for more than 35 years. We have grown from a small pantry to a regional distribution center helping many families who struggle with hunger. We are a proud member of Feeding America, a network of more than 200 food banks. The Feeding America network is the nation’s largest domestic hunger-relief organization and provides more than 3.3 billion meals to virtually every community in the United States. Membership means access to millions of pounds of surplus food and grocery donations. Healthy food. Every person. Every day. Working with our network of partner agencies, volunteers, and donors, the Food Bank of Northern Nevada is constantly accepting and distributing donated and purchased food. Our drivers and program staff work tirelessly to deliver food to emergency food pantries, congregate feeding sites, shelters, senior centers, and child nutrition program sites.